I've been thinking a lot about King's Quest lately. My most recent bout of Sierra nostalgia is likely due to having met a merchant at a comic con selling shadowboxes and prints of classic 8-bit games, such as this piece of desktop art of the opening screen from King's Quest 1. Now this scene of verdant greens and waving flags calls out to me on a daily basis, beckoning me to delve deeper and learn its most difficult of secrets. No, not the location of the three treasures or even the name of the gnome (ifnkovhgroghprm), but the secrets of unraveling the Adventure Game Interpreter (AGI). 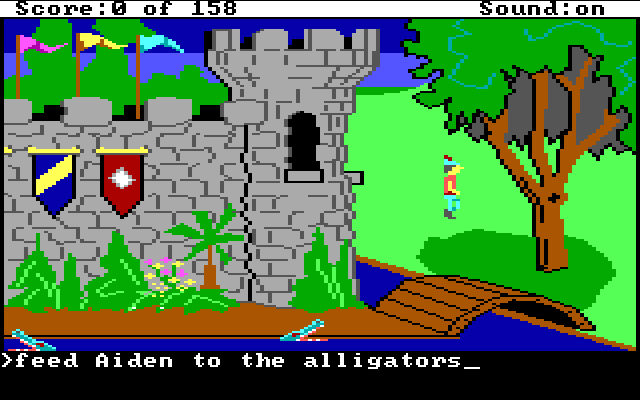 When King's Quest was first released in 1984, it was quite a progressive game for the time. 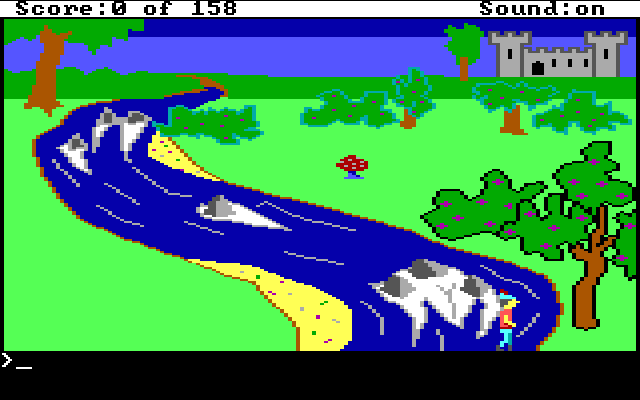 Although I do not recall the exact details, it is quite possible that the first Sierra game I ever played was the original King's Quest back in the mid-1980s. Even thirty-some years later, I am still ferreting out new secrets from this game (e.g. Zombie Goat, Walk On Water, Walk Through Walls), however my interests now delve deeper than finding interesting quirks and easter eggs. A couple days ago I was curious if it was possible to reverse engineer AGI, the game engine which ran fourteen of Sierra On-line's games in the 80s. The original game (and its various remakes) have held up fairly well over the years, but there are still a number of fun "what-if" type of ideas I would love to implement in the AGI version of the game. 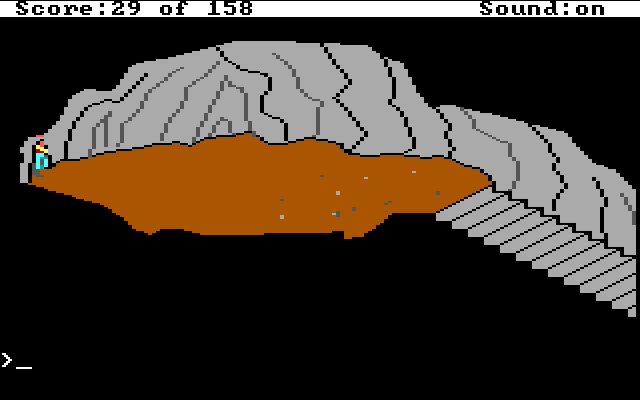 While I am not interested in recreating the entire game, I think it would be a fun exercise to be able to hack the game and make some custom edits to further build upon the 8-bit realm of Daventry.
. You can see the results of Barry's magnificent digital spelunking at the Twitter account @agistuff. Barry has written a number of Python scripts which can extract the data from the common components found in AGI games. However, he is not even the first person to write a series of programs to extract AGI resources. If you look through the various pages of the AGI specifications, there are quite a few contributors, especially Peter Kelly who wrote several programs, mostly in Pascal. It cannot be overstated how amazingly impressive the work is that has been put into figuring out how AGI worked. Inspired by the work previously done by Barry Harmsen and Peter Kelly, I wrote a small program in a mix of Objective-C and C which parses out the words in the WORDS.TOK file and then saves the results into two files: a plain text file and a JSON-formatted file. I mostly followed Barry's Python example, but did take a couple bits of logic from Peter's Pascal code to get my own example working. The following is my code example I used to extract the words from the 1987 PC version of King's Quest 1. This is just my initial dip into the AGI pool, and I hope to return to dive into it deeper. Many thanks go out to Barry Harmsen, Peter Kelly, Lance Ewing, Claudio Matsuoka, and everyone else in the AGI community. Another tip of the ol' adventuring cap goes out to the designers of AGI: Jeff Stephenson, Chris Iden, Sol Ackerman, Robert Heitman, and likely many more who had a hand in creating these Sierra classics. Some people programmed microcontrollers for traffic lights, others developed websites for now-defunct companies, but a few people have been lucky enough to have worked on a product which still garners people's attention even thirty years later. Well played. Well played, indeed. 21 July 2018 Update: I have added two more small programs to extract the directory structure and the inventory objects for AGI games. I am also compiling the extracted words and phrases from a number of the AGI games. The lists can be (*ahem*) interesting at times to see what words are recognized. In some games like KQ1 and SQ2, the programmers took the liberties to include their names as recognized phrases (Mikel Knight and Scott Murphy). KQ2 in particular has some unusual (and unusually naughty) terms, as the programmers took other liberties to slip in some not-so-innocent terms into the vernacular. It is interesting to see how similar terms are grouped together so the game logic has an easier time understanding what is being intended. In King's Quest 2, a number of terms and names for female characters are grouped together. This means that Hagatha, Valanice, maiden, woman, grandma, mermaid, little red riding hood, girl, and hose bag are all equally recognized, even if the actual context in the game is not correct. So you can say kiss valanice while in Hagatha's cave, or say marry hag while in the Quartz Tower (probably not a good way to start off the marriage, Graham! ).